Old copper, like beauty, appears to possess a certain intrinsic quality or charm… [with] an almost living warmth and personality not encountered in any other metal…. You see rich shades of green, red, brown, yellow, and even deep ebony: together not elsewhere matched in nature save perhaps in autumn leaves…. Early coppers are rich in die varieties, cracked dies, imperfect and unusual planchets, mis-struck coins and other minor variations. It is therefore not surprising that to some extent the different die varieties are recognizable by characteristic color and surface texture, as well as by die breaks, peculiarities of the planchet, and so on. New Jersey State Coppers shows that never were these words more true than in the case of the coins struck for New Jersey by Thomas Goadsby, Albion Cox, Walter Mould, and Matthias Ogden from 1786 until as late as 1790. 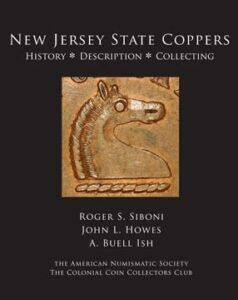 By way of introduction, the authors fully discuss the often tumultuous history of the New Jersey copper coinage and its creators alongside the equally compelling story of the men, like Dr. Edward Maris, who first appreciated the “living warmth and personality” of the coins and formed the great collections of the nineteenth and twentieth centuries. Every known New Jersey die variety is presented in minute detail with lavish enlarged full-color illustrations, condition censuses, as well as commentary on die states and other notable features. The authors also include such supplementary material as the original documents related to the eighteenth- century coining venture, imitations created for the collector market in the nineteenth century, as well as suggestions for developing a personal collection. 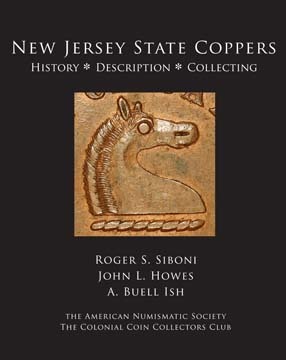 New Jersey State Coppers will surely become the primary tool for the study of this coinage and the basis for deepening the understanding and appreciation of its charm as old copper.